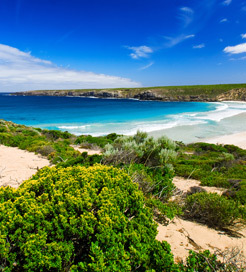 Kangaroo Island can be found in the state of South Australia, around a 70 miles from Adelaide and about nine miles from the mainland at its closest point. After Melville and Tasmania, Kangaroo Island is the third largest island in Australia and covers an area of more than 1,500 square miles. Attracting over a hundred thousand visitors annually, the Island is one of South Australia's most popular tourist attractions for both domestic and international visitors. The Island is made of six unique regions. The biggest town and commercial hub is Kingscote where you’ll find a number of shops and a range of accommodation options as well as nearly half of the Island’s population. Penneshaw and Dudley Peninsula in the east is where the ferries dock and therefore the entry point for most of the islands visitors. American River in the north east is known as an interesting little town, Parndana runs across the centre and is commonly referred to as the heartland of Kangaroo Island while the West End is the place to go for wild, rugged and natural beauty. The North Coast is a contrast of sandy coves and stunning views while the South Coast is one of the most popular destinations on the island, not least due to the fact it houses one of Australia’s finest beaches. Getting to the island is relatively simple by ferry with daily crossings on offer from the ferry company Kangaroo Island Sealink. Their two large catamarans sail across Backstairs Passage between Cape Jervis on the Fleurieu Peninsula and Penneshaw on the east side of Kangaroo Island. The trip takes just forty five minutes running four times daily in each direction with additional services put in during busy periods. For more information, please visit our Ferries from Australia to Kangaroo Island page.